By Rev. J. Owen Dorsey. Read before the Philosophical Society of Washington, D.C.
Iowas, Otoes, and Missouris, IV. The Mandan, V. The Hidatsa and the Crows, VI. The Tutelos now in Canada: and to these some add a seventh group, the Kata'ba of South Carolina. The Omahas, to the consideration of whom this essay is limited, form a tribe of the Dhegiha group. This group consists of Upper Dhegiha or Omahas and Ponkas; and Lower Dhegiha or Quapaws; Osages and Kansas. Dhegiha means "belonging to the people of the land." It answers to the Otoe—Olwere, and the Iowas—Oekiwere. If an Omaha or Ponka be challenged in the dark when on his own land, he will reply, "I am a Dhegiha." A Kansas, on his own land, will say, "I am he who is a Dhegiha." 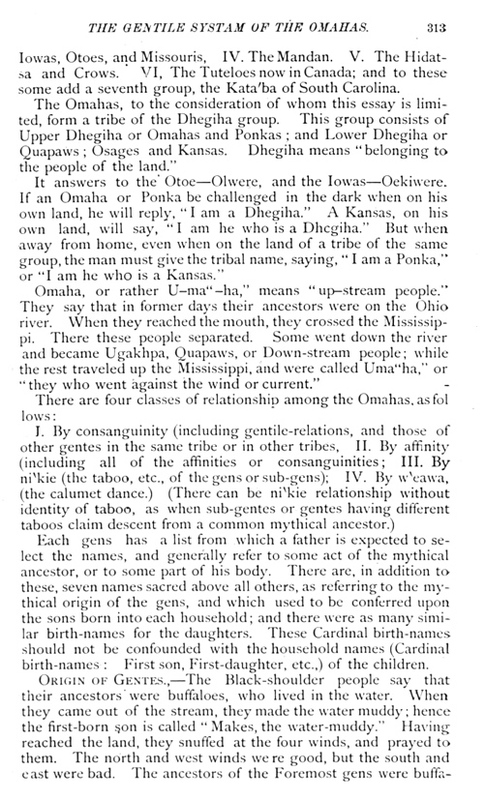 But when away from home, even when on the land of a tribe of the same group, the man must give the tribal name, saying, "I am a Ponka," or "I am he who is a Kansas." Omaha, or rather U–ma "–ha," means "up–stream people." 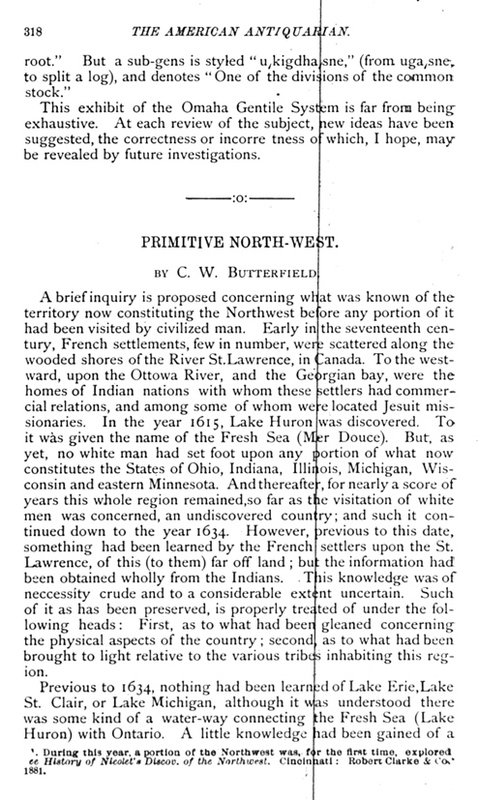 They say that in former days their ancestors were on the Ohio river. When they reached the mouth, they crossed the Mississippi. There these people separated. Some went down the river and became Ugakhpa, Quapaws, or Down-stream people; while the rest traveled up the Mississippi, and were called U-ma "ha," or "they who went against the wind or current." Each gens has a list from which a father is expected to select the names, and generally refer to some act of the mythical ancestor, or to some part of his body. There are, in addition to these, seven names sacred above all others, as referring to the mythical origin of the gens, and which used to be conferred upon the sons born into each household; and there were as many similar birth-names for the daughters. These Cardinal birth-names should not be confounded with the household names (Cardinal birth-names: First son, First-daughter, etc.,) of the children. ORIGIN OF GENTES.,—The Black-shoulder people say that their ancestors were buffaloes, who lived in the water. When they came out of the stream, they made the water muddy; hence the first-born on is called "Makes the water-muddy." Having reached the land, they snuffed at the four winds, and prayed to them. The north and west winds were good, but the south and east were bad. 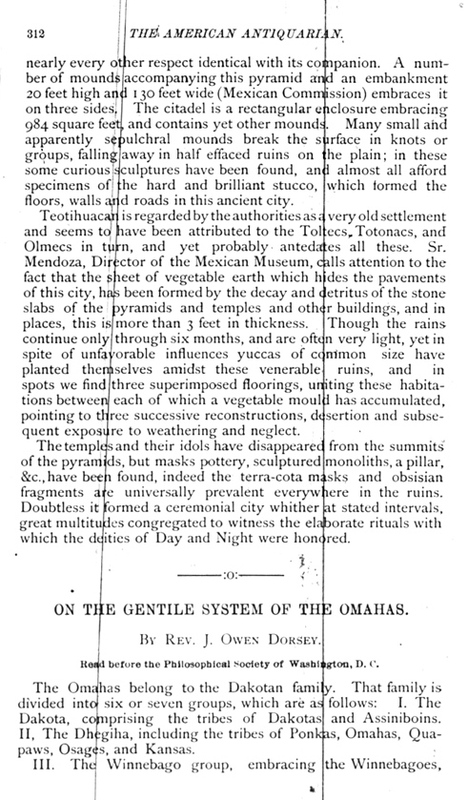 The ancestors of the Foremost gens were buffaloes and lived under the water. They moved about with their heads bowed down, and their eyes closed. By and by they opened their eyes in the water; hence their first name, "Opening their eyes in the water," which is also their birth-name for the First son. Emerging from the water, they lifted their heads and saw the blue sky for the first time, hence they took the name of "Clear Sky Makers." The Ingdhe-zhide or the Red dung gens, has been so called since the visit of the seven old men with the sacred pipes. When they reached the camp of their sons, they found the erect body of a buffalo partly buried in the ground visible from the flanks up. The animal had been flayed, and the skin was made into a tent. The body was bloody and frightful to behold so the old men passed by without giving the pipe. The only thing pointing to the mythological origin of the Elk gens is the sacred bag of that people. This bag is the skin of a prairie-wolf, and contains a clam or oyster-shell, the bladder of a male-elk filled with killickinnick, some tobacco leaves, a pipe, a cedar stick, and a piece of the sinew of the male elk. 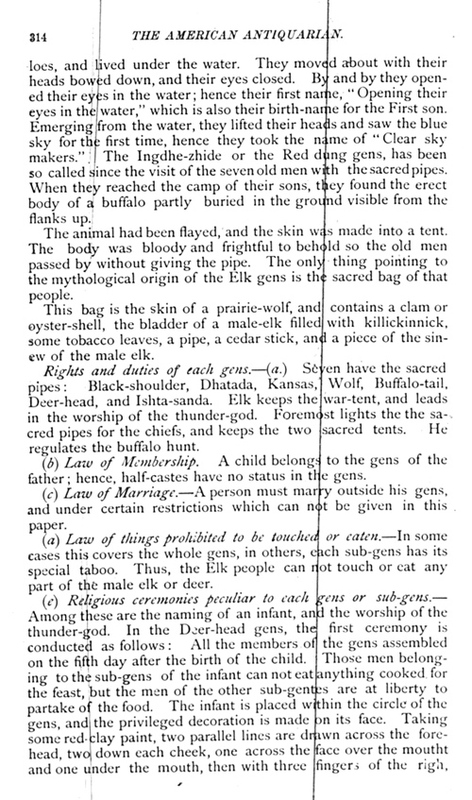 (a) Rights and duties of each gens.—Seven have the sacred pipes: Black-shoulder, Dhatada, Kansas, Wolf, Buffalo-tail, Deer-head, and Ishta-sanda. Elk keeps the war-tent, and leads in the worship of the thunder-god. Foremost lights the sacred pipes for the chiefs, and keeps the two sacred tents. He regulates the buffalo hunt. (b) Law of Membership.—A child belongs to the gens of the father; hence, half-castes have no status in the gens. (c) Law of Marriage.—A person must marry outside his gens, and under certain restrictions which can not be given in this paper. (d) Law of things prohibited to be touched or eaten.—In some cases this covers the whole gens, in others, each sub-gens has its special taboo. Thus, the Elk people can not touch or eat any part of the stale elk or deer. hand, red spots are made down the back of the child, at short intervals, in imitation of the fawn. The child's breech-cloth is so marked. On its arms and chest are rubbed stripes as long as the hand. All of the Deer-head people in attendance, even the servants, decorate themselves: rubbing the rest of the red paint on the palms of their hands, they pass their hands backward over their hair; and they finally make red spots on the chest, about the size of the palms of their hands. The members of the Pipe sub-gens, and those persons in the other sub-gentes who are related to the infant's father through the calumet dance, are the only ones who are allowed to use the privileged decoration, and to wear fine feathers in their hair. If the child belongs to the Pipe (or Eagle) sub-gens, char-coal, blue-clay, and the skin of a wild-cat are placed beside him, as the articles not to be touched by him in after life. Then they say to him: "This you must not touch; this too you must not touch; and this you must not touch." The blue-clay symbolizes the blue-sky. According to the Iowa tradition, the Eagle people came down from the sky. Worship of the Thunder-God.—When the first thunder is heard in the spring of the year, Elk invites Bear to a feast. On his arrival Bear opens the sacred prairie-wolf bag, takes out the pipe and the elk-bladder tobacco-pouch which Elk dares not touch, Bear then takes some tobacco or killickinnick from the pouch, and fills the pipe. The lighted pipe is held up towards the sky, and the thunder-god is thus addressed: "Well, venerable man, by your striking you are frightening us, your grandchildren who are here, Depart on high." Then all present smoke the pipe, and join in the feast. It is alleged that at the conclusion of the feast the rain always ceases, and the Bear people return to their homes. (f) Style of Wearing the Hair.—The boys of each gens are obliged to wear their hair in a prescribed style. The Buffalo people have four long locks, two on each side, in immitation of (the legs of) the buffalo. The Bird people have four locks, representing the head, tail, and wings of a bird. The Turtle people have six locks, in immitation of the head, tail, and legs of a turtle. Peculiar customs of the gens. I give two examples. The Kansas Wind people flap their blankets to and fro, to raise a wind that will drive away the mosquitoes. When the corn-fields of the Ishtasanda gens are troubled with a certain species of worm, the men proceed as follows: They beat some grains of corn, and then pound up with this, a number of the worms. They make a soup of the mixture, and when that is eaten, they imagine that they will have no more trouble. cases, are divided into four Sub-Sections. The Elk sub-gentes are: 1. Elk. 2, Keepers of the war-tent; 3. Thunder; and 4, one whose name is unknown to me. The Black-shoulder, subgentes are: 1, Keepers of the Pipe (Eagle people), or They who eat no red corn. 2, They who touch no char-coal. 3, They who eat no buffalo tongues, and touch not a buffalo head; and 4, The Criers or Heralds. Foremost sub-gentes: 1, They who eat not the sacred buffalo meat; 2, Real Foremost, they who eat no buffalo tongues; 3, Servants of the Sacred-Tents; and 4, They who touch not "Blue-skins." Dhatada sub-gentes: 1, Bear; 2, Bird; 3, Eagle; 4, Turtle. Two of the Kansas sub-gentes are 1, Keepers of the Pipe and 2, Wind people. Earth-Lodge sub-gentes: 1. Prairie-Wolf and Wolf, 2, Keepers of the Sacred Stones; 3, Keepers of the Pipe; 4, They who touch not a white swan (not taboo.) 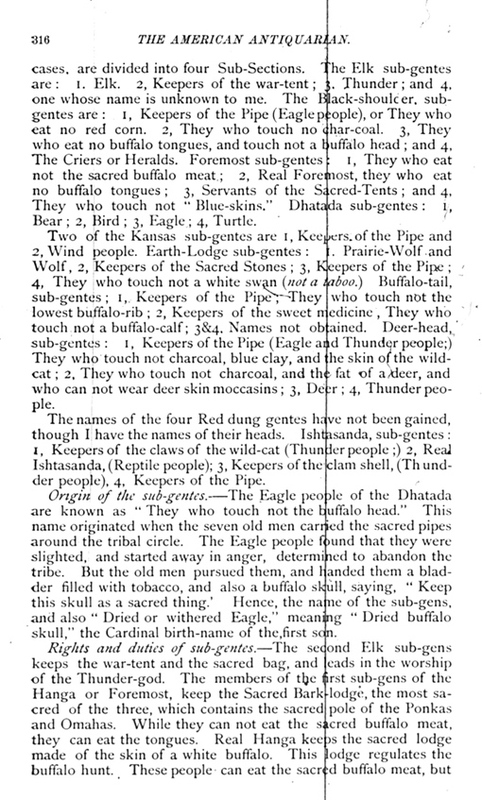 Buffalo-tail sub-gentes; 1, Keepers of the Pipe; or They who touch not the lowest buffalo-rib; 2, Keepers of the sweet medicine, or They who touch not a buffalo-calf; 3&4. Names not obtained. Deer-head sub-gentes: 1, Keepers of the Pipe (Eagle and Thunder people;) They who touch not charcoal, blue clay, and he skin of the wild-cat; 2, They who touch not charcoal, and the fat of a deer, and who can not wear deer skin moccasins; 3, Deer; 4, Thunder people. The names of the four Red dung gentes have not been gained, though I have the names of their heads. Ishtasanda sub-gentes: 1, Keepers of the claws of the wild-cat (Thunder people;) 2, Real Ishtasanda, (Reptile people); 3, Keepers of the clam shell, (Thunder people), 4, Keepers of the Pipe. Origin of the sub-gentes.—The Eagle people of the Dhatada are known as "They who touch not the buffalo head." This name originated when the seven old men carried the the sacred pipes around the tribal circle. The Eagle people found that they were slighted, and started away in anger, determined to abandon the tribe. But the old men pursued them, and handed them a bladder filled with tobacco, and also a buffalo skull, saying, "Keep this skull as a sacred thing." Hence, the name of the sub-gens, and also "Dried or withered Eagle," meaning "Dried buffalo skull," the Cardinal birth-name of the first son. not the tongues. The members of the Bear sub-gens assist the Elk people in the worship of the Thunder-god. The Raccoon section of this sub-gens is called Kh'u-ka, because its members are the Singers whenever there is a dance. 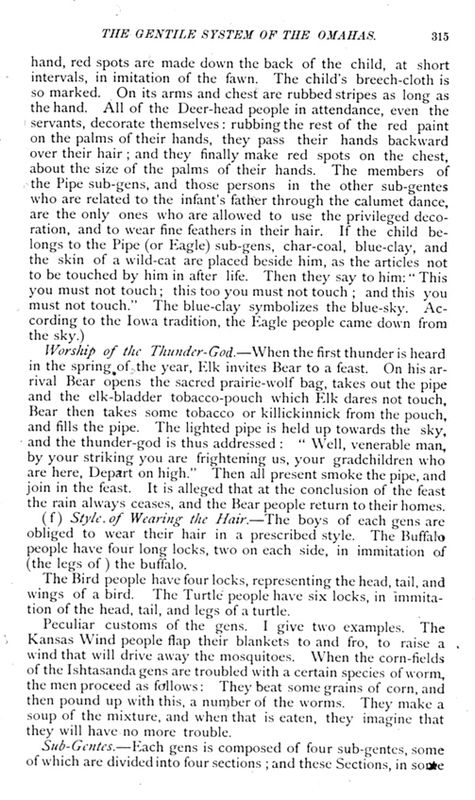 The Eagle people keep the sacred buffalo skull (used in inaugurating chiefs), and fill the sacred pipes for the chiefs. (Foremost lights the pipes for the chiefs.) 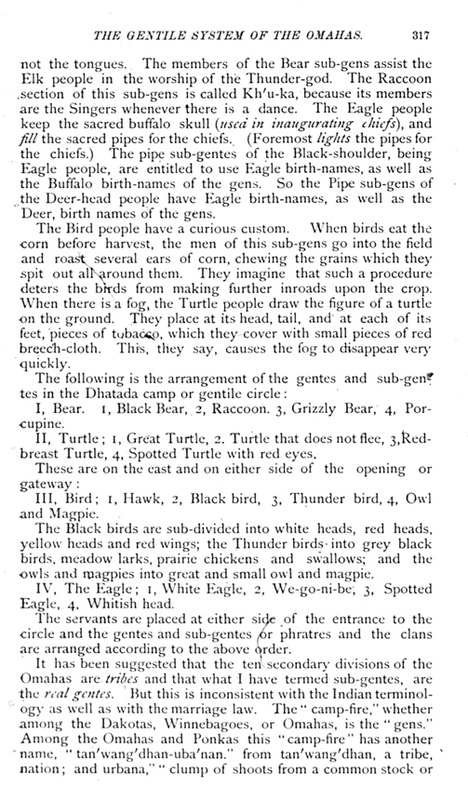 The pipe sub-gentes of the Black-shoulder, being Eagle people, are entitled to use Eagle birth-names, as well as the Buffalo birth-names of the gens. So the Pipe sub-gens of the Deer-head people have Eagle birth-names, as well as the Deer, birth names of the gens. The Bird people have a curious custom. When birds eat the corn before harvest, the men of this sub-gens go into the field and roast several ears of corn, chewing the grains which they spit out all around them. They imagine that such a procedure deters the birds from making further inroads upon the crop. When there is a fog, the Turtle people draw the figure of a turtle on the ground. They place at its head, tail, and at each of its feet, pieces of tobacco, which they cover with small pieces of red breech-cloth. This, they say, causes the fog to disappear very quickly. I, Bear. 1, Black Bear, 2, Raccoon, 3, Grizzly Bear, 4, Porcupine. II, Turtle; 1, Great Turtle, 2. Turtle that does not flee, 3, Red-breast Turtle, 4, Spotted Turtle with red eyes. III, Bird; 1, Hawk, 2, Black bird, 3, Thunder bird, 4, Owl and Magpie. The Black birds are sub-divided into white heads, red heads, yellow heads and red wings; the Thunder birds into grey black birds, meadow larks, prairie chickens and swallows; and the owls and magpies into great and small owl and magpie. IV, The Eagle; 1, White Eagle, 2, We-go-ni-be, 3, Spotted Eagle, 4, Whitish head. The servants are placed at either side of the entrance to the circle and the gentes and sub-gentes or phratres and the clans are arranged according to the above order. root." But a sub-gens is styled "u,kigdha,sne," (from uga,sne; to split a log), and denotes "One of the divisions of the common stock." This exhibit of the Omaha Gentile System is far from being exhaustive. At each review of the subject, new ideas have been suggested, the correctness or incorrectness of which, I hope, may be revealed by future investigations.